As long as human beings have been fighting, and probably even before modern human beings existed, the counterpart to offense was defense—lashing out, holding up arms, standing behind something to soak up the attack, or bringing something with you to use as a shield. Some of the most "primitive" societies carved sections of wood to use to deflect blows—early shields. And for a long time, the shield was the primary means of defense, first as that carved stick, then as wicker or hide, eventually of metal. Parallel with the shield, and eventually displacing it almost entirely, was body armor. Shields still exist for riot control, for example, but not presently for combat usage, and it seems unlikely they'll return. 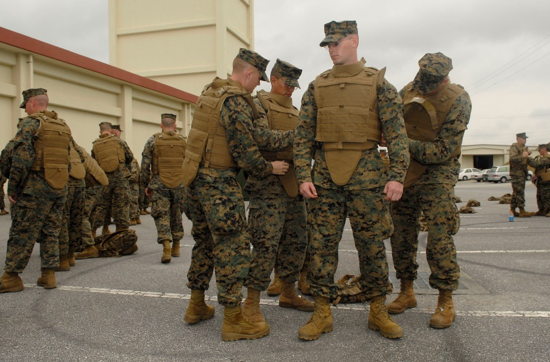 Armor at its simplest is anything that will prevent or reduce damage to the person wearing it. In a street fight, a thick coat helps prevent against knife slashes or softens the impact of thrown rocks. In modern combat, laminated ceramic with aramid fiber backing can stop most rifle bullets or fragmentation. 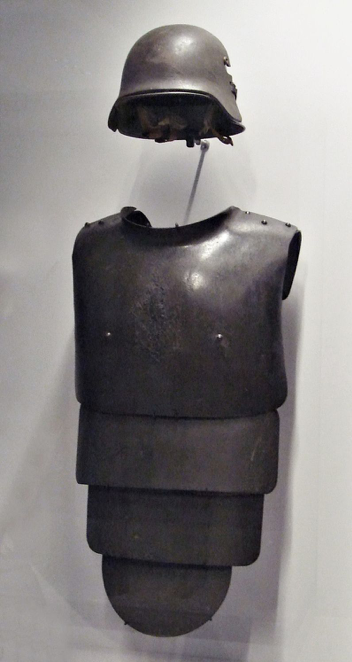 The earliest armor has not survived, but we assume it would have been sections of animal hide. However, once textiles enter the picture, hide, wood, bone or horn laced together, or even just heavy cording braided into a sheet became available, allowing for better fitting, replaceable sections, and stronger armor that still has flexibility. Even clay and stone plaques were used on occasion. It all served the same purpose—keeping internal organs and fluid inside where they belong. Examples of all these, including slabs of animal bone lashed together, appear at least 3500 years ago. Animal hide can be hardened by drying, or heating until the collagen toughens. Wood, bone or tusk sections serve to both prevent penetration and disperse impact. All these were likely common through the Neolithic and Chalcolithic, some continued into the Bronze Age and beyond. The same concepts persist today with plastic armor used for police riot control, or for impact sports. 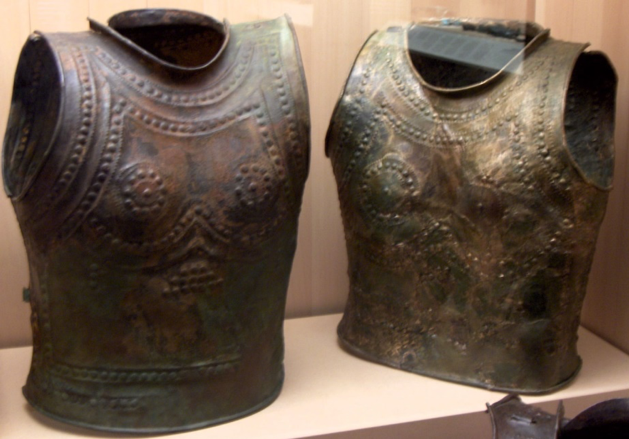 In the early Bronze Age, with bronze being very much a status symbol, men of status might wear a bronze breastplate—typically just round or rectangular, over the critical areas of the chest. 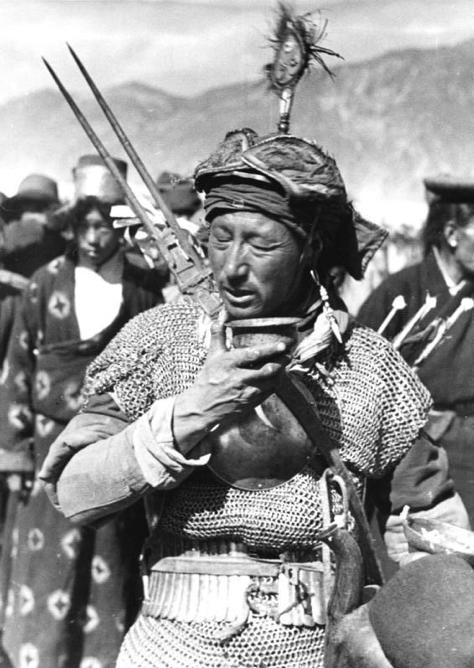 In addition to serving as protection for critical organs, it indicated status or wealth, making the leaders easier to see, and was often polished for spiritual protection. This and a helmet would be worn over leather or quilted fabric, which provided additional protection against slashes and some amount of impact. 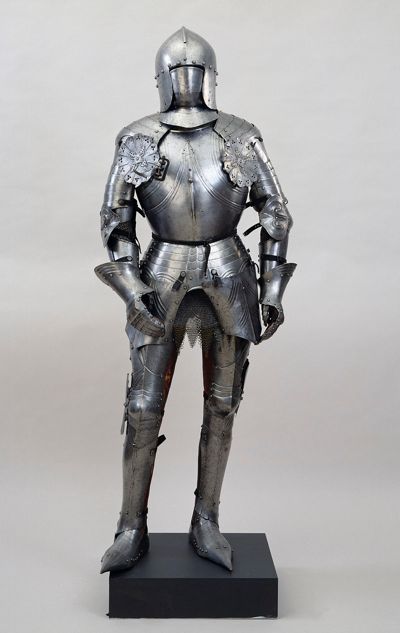 Some of the other early armor is almost a capote—draped over the shoulders, protecting the chest and upper back. The Chinese seem to have been the first to take the notion of the laced sections to the next step, making beautifully scaled bronze armor, though the technology quickly appears with the Persians, Indians, and others, and has remained in use all the way to the present. Initially laced to a garment, it wasn't long before the scales were braided to each other, and of course, decorated. While predominating in Asia and the Near East, the technique has been found across Europe and North Africa. Useful knowledge is always transferred when encountered. 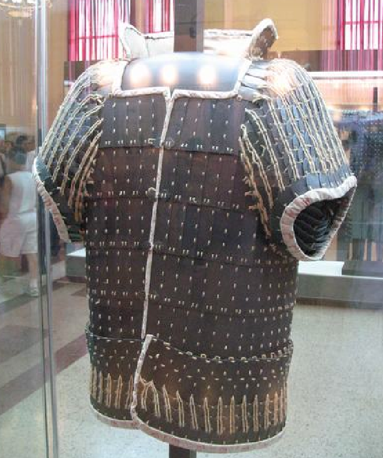 Chinese scale armor of the Han Dynasty. Image: Qiushufang, Wikipedia. However, metal scales were expensive. Hardened or lacquered leather, wood, even stone or lacquered paper scales also came into use in China. Anything that reduces a thrust, cut or blow increases a warrior's survivability. Worn over padding, most melee attacks could be blunted or stopped with some effect. Any of these armors might be reinforced with an additional chest plate, or additional shoulder guards. 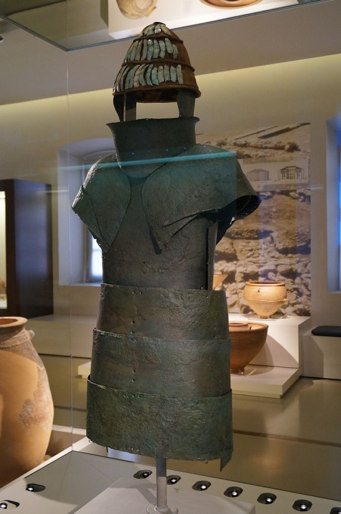 Urnfield Celtic bronze cuirass—a design familiar to this day. Image: Calame, Wikipedia. A breastplate and backplate, shaped to fit the wearer's torso, constitutes a cuirass, and the design has persisted because it works. It doesn't protect the limbs or head, but other armor can do that. It does cover the critical organs with what one hopes, for the technology of the day, is a near unbreachable shell. Possibly the first modern armor ensemble is the Dendra Panoply from the late 15th Century BCE. The Mycenean Dendra Panoply. Image: Schuppi, Wikipedia. It was a cumbersome assembly that turns a warrior into a tank, reminiscent of Elmer Fudd in "What's Opera, Doc?" Nevertheless, the torso armor had breast and back plates, along with a lamellar kilt for the thighs, lamellar shoulder guards, and armor for the neck, all held together with thong and leather backing. Included was a helmet of boar tusk slices, and arm and leg guards. Movement would have been difficult, but not impossible. It does allow range of motion for sword or spear use. It would certainly have been imposing to look at. While heavy, it offered strong protection against spears and arrows of the era. However, it was probably mostly ceremonial. Not many such outfits could exist. The construction technique will be relevant again, though. What our predecessors understood, but possibly not mathematically, we can put numbers to. If you wear the armor 100 percent of the time you are facing a threat, and it stops 80 percent of the threats you face, and covers 70 percent of your critical areas (heart and both major arteries, liver, lungs, kidneys, and let's add the helmet for brain), then you have 56 percent survivability of those hits. You can make the armor tougher, though probably heavier, or increase the covered area, likely with reduced mobility, and increase that percentage into perhaps the 70s. But, you must consider the loss of mobility and the increased probability of hits. This is harder to calculate individually, and must be done statistically after the fact. The Dendra armor increased protection significantly, but reduced mobility and effectiveness considerably. The next development brings armor to what we recognize now. Chest/shoulder protection, possibly something for the groin, and a helmet. The Celts and others used the hammered bronze cuirass mentioned above. The Greeks used bronze, or the laminated linen linothorax—precursor of modern ballistic fiber. Tests show it to be flexible, easy to make and wear, and very resistant to spear thrusts and arrows. Keep in mind they stood behind a three foot shield of bronze, leather, wood and felt, sometimes with a drape against arrows. Add a helmet and greaves and they were very well protected against anything short of modern firearms, and even against some of those. Layered cloth is in fact the primary modern body armor. Historically, it was also used in Persia, Korea and China. 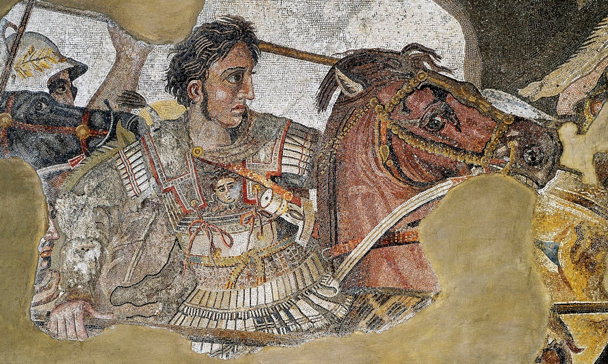 Alexander the Great, wearing linothorax armor of layered fabric. Image: Wikipedia. The Celts developed mail, worn over padding, which was adopted by the Romans and others. Welded or riveted mail backed with padding will stop most cutting edges, and reduce blunt trauma. Mail is far tougher than people credit it, especially if they've only seen that made with rings butted closed and not riveted or welded. Then, consider it being supplemented with the standard helmet and shield, with a second layer of mail over the shoulders. It even stops most arrows and crossbow bolts. Of course, if you then forge a long iron point for your arrows . . .
Lorica Hamata—Roman mail with additional shoulder protection, the concept acquired from the Celts. Image: Greatbeagle, Wikipedia. 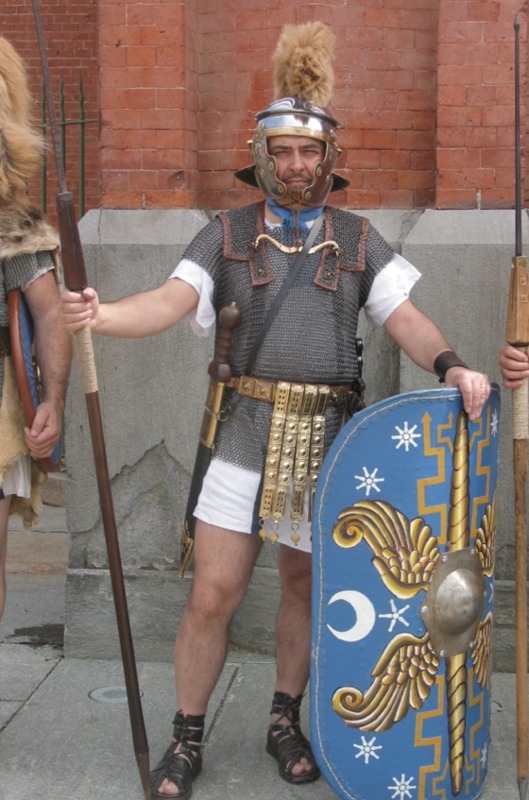 The Romans used mail and scale, and eventually improved the lamellar bands of the Dendra armor into something portable, flexible, and easy to mass produce—the Lorica Segmentata (this is our modern name for the type). You'll notice an obvious lineage between the two. Though as effective as Segmentata was, it seems not to have displaced either mail, scales or hammered cuirasses. 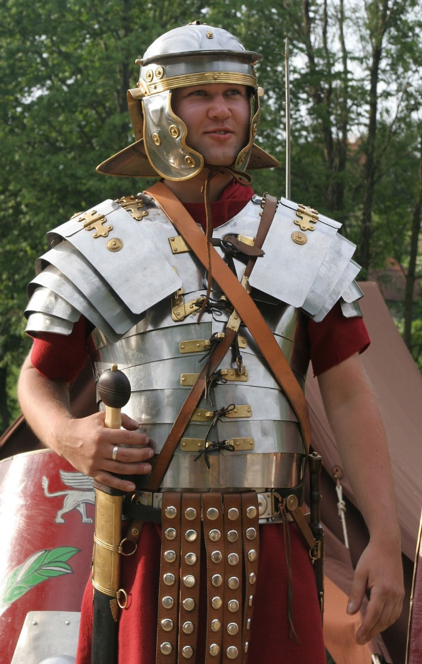 Lorica Segmentata, possibly the best working development of banded armor. Image: Wikipedia, Medium69. 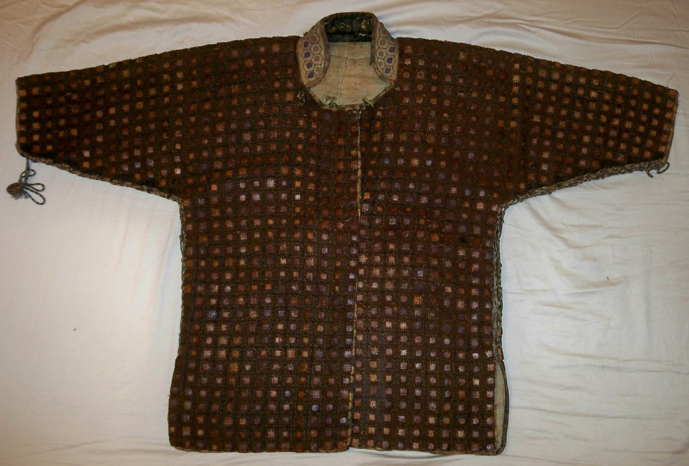 Through the Dark Ages in Europe, and into the Middle Ages, mail remained popular in many countries, but padded and quilted fabric—gambeson—was the go-to for the working classes, and the base under other armor. Relatively easy to make and repair, it would reduce slashes, slow and hinder thrusts, and cushion blows. 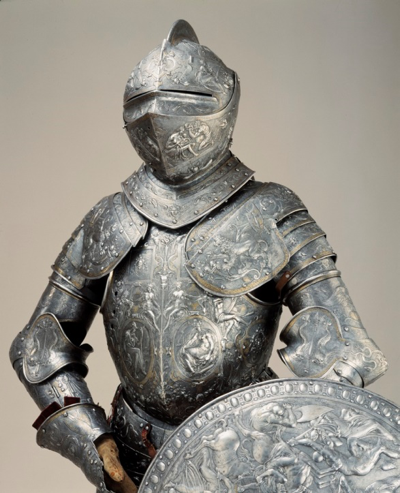 Those with money might have additional armor layers and protection for the limbs, but everyone who could armored their torso and shoulders, and almost always with padding first. The Middle East also went with mail and reinforcing segments, often elaborately decorated for art and spirituality. I've seen an Arab mail hauberk where every ring was engraved with one of the Names of Allah—The Beneficent, The Merciful, The All-Seeing, etc. Certainly the owner deemed this would strengthen the armor through divine intervention. As the armor survives to this day, he obviously did something right. 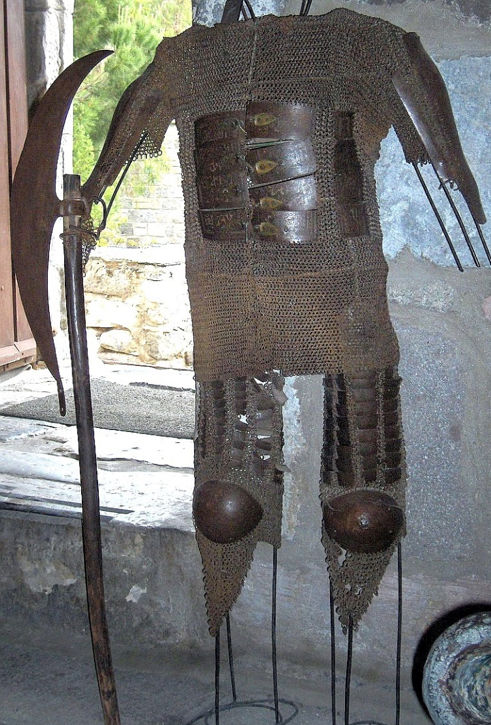 Turkish mail armor with reinforcing plates. Image: JoJan, Wikipedia. I've seen a Turkish piece where every other row is of stamped rings that have a cross-piece, like a digital Ø. The alternating rows were perfectly scarf-welded closed—overlapped, heated and beaten. And the rings were tiny—about 1/4". This would have been incredibly strong for its weight, and was very flexible. It is almost 400 years old, but still being worn for fighting by a modern re-enactor. This brings us to the ever-popular leather armor, which certainly was popular, when one could get it. The best leather for armor comes from bulls of a certain age, and off the back and sides. This precludes using the animal for quality meat, or draft use, and thus makes it expensive to produce. Leather can be hardened with hot (but not quite boiling) water to shrink the collagen and other fibers. However, it will eventually soften from sweat, rain or oil, and can mold if not treated. Again, it was used, but not as commonly as movies would suggest. And of course, poorer warriors would certainly grab a blacksmith's apron, a spare hide, or a large chunk of tanned leather, and use it on its own or over padding to improve their defense. Still, if you were outfitting an army, or had money, forged iron was far more effective, cost effective, and durable. A common accessory throughout the later Dark Ages and well into the Middle Ages was what we refer to as "jack chains." These are articulated rods along the outside of the arms, providing protection against any kind of edge or impact. The blow is dispersed along the length. 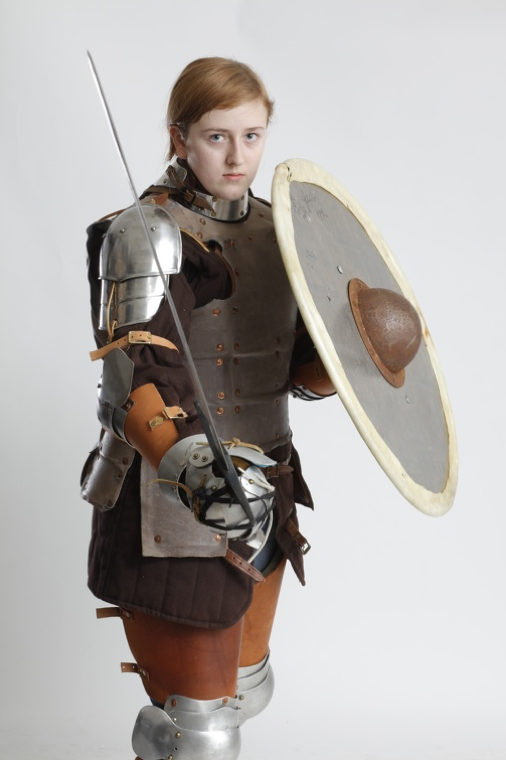 While not as good of coverage as actual forged arm protection of vambraces, elbow cops and rerebrace, they are much cheaper to forge, far easier to shape, and significantly better armor than padding by itself. Notice that most armor still starts with the upper thorax, then the rest of the torso and limb joints, and skull. Protecting the extremities is tertiary, more expensive, and also hinders motion to some degree. Though armorers are an inventive lot, and fully articulated armor was demanded by their sponsors. There are three forms of this: that worn for actual fighting, which might be very pretty, but was also very sturdy. That worn strictly for dress, which was often chased, engraved, enameled, and might be a bit less sturdy, though still functional. And that worn for tournament fighting, the equivalent of modern football or hockey padding. This is very commonly seen in pictures, but upon examination sacrificed a lot of mobility for safety. Italian armor of about 1450. Image: Walters Art Museum, Wikipedia. Parade Armor from 1562, belonged to Erik XIV of Sweden. Made by Eliseus Libaerts and Etienne Delaune. Image: Göran Schmidt, Wikipedia. Jousting armor, meant more for sport, and with very limited mobility. Image: Sandstein, Wikipedia. I'd like to debunk a common myth—that plate armor was over 100 lbs and rendered one incapable of standing up after a fall, or even more ludicrously, required a crane to mount a horse. In fact, good articulated armor was in the range of 40 lbs, and there are videos of modern dancers wearing reconstructed suits and performing all kinds of maneuvers up to somersaults and hand springs. If the armor didn't work, it wouldn't have had a market (We are speaking of field armor, not dressier parade armor, or dedicated sporting armor). Of course, this stuff was custom made and expensive. What did common soldiers wear that offered good protection? Brigandine armor was a variation of the lamellar, with the scales being sewn inside a leather or fabric "jack" or jacket. A modern re-enactor in brigandine—plates riveted into a leather jack, over gambeson, with additional armor protection. Image: Oleg Volk, OlegVolk.net. Much of Asia continued to use variations of scales and mail, linked or laced together, lacquered for beauty, durability, and additional strength. Against the weapons they faced, it worked well. Shields were less common, since two-handed sword use and spear use predominated. Mongolian mail with a small breast plate. German Federal Archive, Wikipedia. 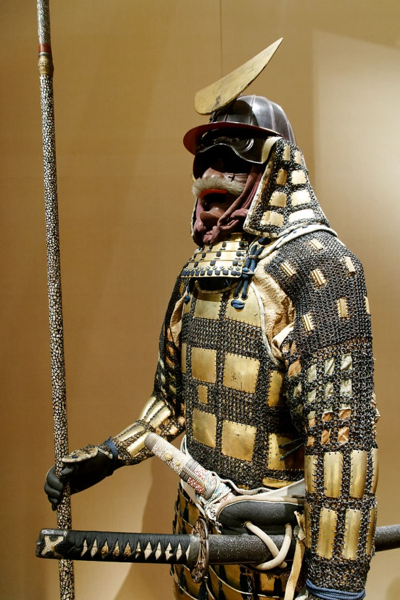 Japanese armor of mail and leather scales. Image: Samuraiantiqueworld, Wikipedia. And with metal scales. Marie-Lan Nguyen, Wikipedia. 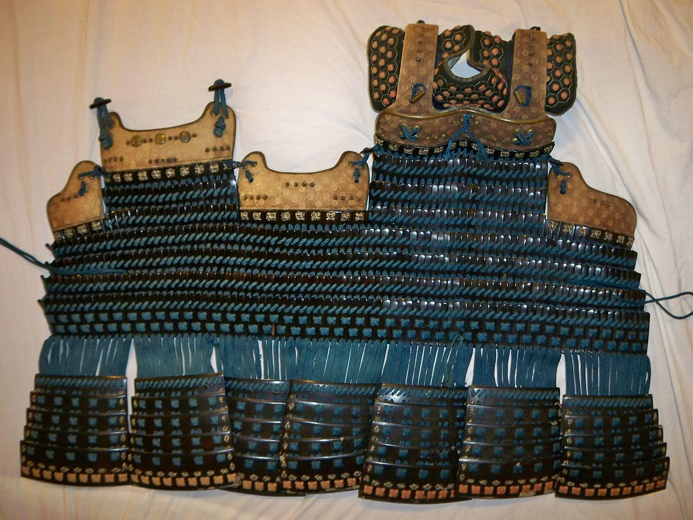 Japanese lamellar armor, scales woven together with cord. Image: Samuraiantiqueworld, Wikipedia. 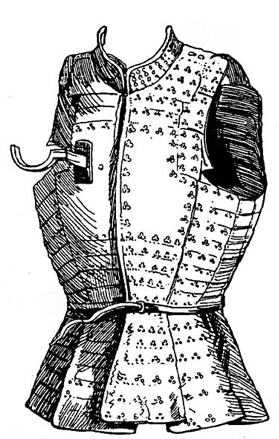 One Eastern variation on the gambeson was layers of silk, which were both tough and likely to stop cuts and thrusts, and also could encapsulate a stabbing point or arrowhead, thus keeping the wound relatively clean and much easier to treat. We should note at this point (into the 1500s) that early European martial arts were every bit as complex and athletic as Asian arts. Blocks, parries, elaborate movement and flexibility were all taught and well-regarded, including defense against mounted cavalry while "fencing" with a spear. A look at several manuscripts from the era show dramatic moves and techniques. So what happened to those arts? This was a massive game-changer. Elaborate one-on-one fighting failed against bullets. Strong formations crumbled against massed musket fire, even more than they had to archery. The archers had taken months or years to train. Massed musketeers could be drilled in days. While the bow offered many advantages—rate of fire, better penetration at many ranges, accurate indirect fire, and better wounding for trauma with deep piercing cuts, it was a fact that musketeers could be more numerous and replaced faster. Nor was forging gun barrels any more time intensive than carefully drying, tillering and shaping bows, splitting arrows, forging tips, fletching shafts, and twisting strings. The shield disappeared almost entirely. One needed both hands for a bow or firearm, and making a strong enough shield meant a lot of metal and a lot of mass. We still see them for riot control and such, but not as credible battlefield tools. Armor persisted, however. 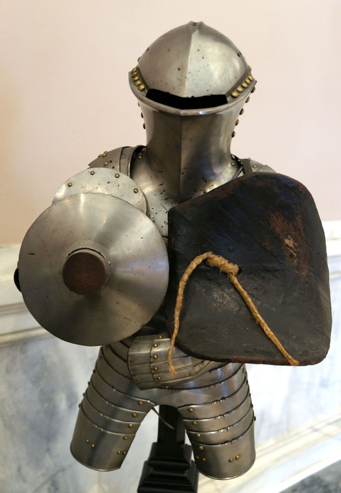 During the English Civil War, Cromwell's troops often wore a double layer of steel armor capable of stopping most musket balls of the day, and very effective against swords or impact. This latter was important. As long as firearms had to be charged by hand for each shot, with long seconds in between, plenty of lances, sabers and spears remained on the field, along with bayonets. 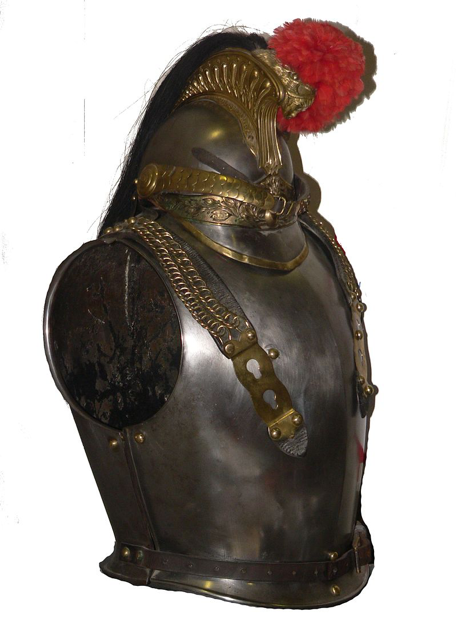 Musketeers often wear heavy leather coats with an additional breast plate, and cavalry wore the cuirass we've seen all along, now in tempered steel, through the Napoleonic era. 1854 French cuirass. Image: Rama, Wikipedia. Armor fell out of style for a short time after this. Firearms became powerful and accurate enough that most armor was not cost effective. Certainly, it might save some of the troops from wounds, but it also cost a lot of money for larger armies, used copious amounts of metal, weighed down both baggage trains and cavalry horses, and was deemed not worth the expenditure against return. There were some "bulletproof vests" in use in the U.S. Civil War, made of heavy hardened steel plate. Some WWI machine gunners likewise had very crude armor to protect them while sitting exposed and laying down fire. Once again, the key protection was torso and head. Though as articulated armor had gone largely out of style, the versions of that era are crude and clumsy. German trench armor of WWI. Image: PHGCOM, Wikipedia. 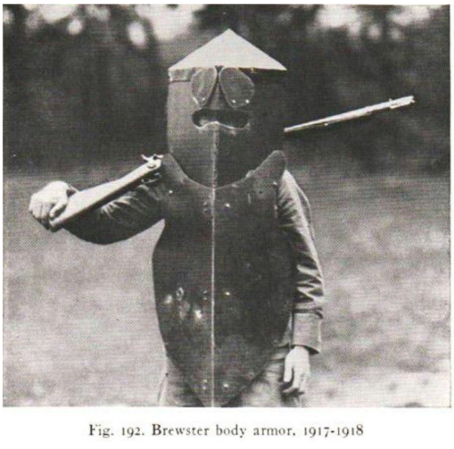 Brewster Body Shield, American. WWI. Image: Bashford Dean, Wikipedia. Everyone is familiar with the thin steel helmets of WWI and WWII, which mostly protected against thrown fragments and debris. With firearms reaching the level where they could shoot holes through any steel plate, there was no reason to encumber oneself with armor at all when maneuvering—the armor moved onto the tank and its tracked cohorts, which is another discussion. And so it remained until another technological advance. The big development for WWI was precision artillery with timed fuses so as to detonate over the enemy, and scattering fragmentation—shrapnel. The helmets helped protect the head from that, and from bumps and strikes. The torso, though, had been neglected. There was effectively no cavalry, and bullets weren't able to be stopped effectively. Post-war studies, though, showed that fragmentation was the primary cause of wounds. This was largely neglected until WWII came along, with thousands of bomber crews taking flak—anti-aircraft fire, full of fragments. Shortly, bomber crews (fighter craft were usually too cramped for it) wore ballistic armor of layered nylon—the Greek linothorax updated as a nylothorax, if you will. Unaerodynamic fragments were slowed and many stopped, reducing both wound numbers and severity. Meanwhile on the ground, certain exposed troops—Canadian medics among them—were equipped with steel plates. The Russians did the same for assault engineers. They were proof against pistols, might deflect an angled rifle shot, and did stop most fragmentation. Meanwhile, Japanese pilots gained steel plates in vests to reduce wounds in combat. Some very heavy armor was developed for landing craft crews. Doron, a Dow product, was a fiberglass based laminate plate inserted into vests for some troops during the Okinawan campaign. Scale or brigandine armor was back for yet another round. It did not stop bullets, but it did protect against shrapnel. During the Korean War, the U.S. Army developed a nylon armor with reinforcing plates of plastic or aluminum sewn in. However, it was still not effective at stopping most rifle bullets. 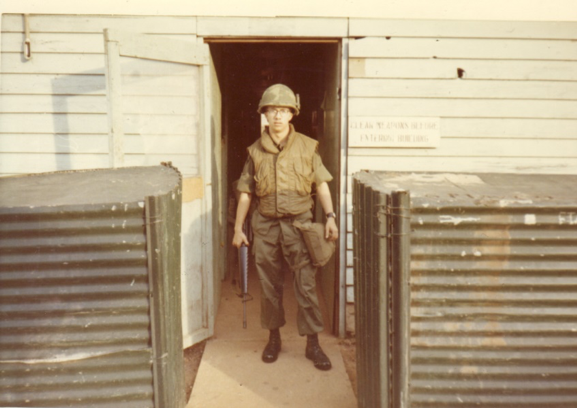 Moving into Vietnam, nothing changed in style, but materials somewhat improved. A different nylon provided improved fragmentation protection, while being lighter and, if not more comfortable, at least less uncomfortable. This remained in U.S. issue into the 1980s. It should be familiar from movies and newsreels. A Vietnam Era U.S. Soldier in a nylon flak jacket. Image: Dwight Burdette, Wikipedia. The same strategy continued with the PASGT (Personnel Armor System for Ground Troops) body armor of the 1980s, and its worldwide counterparts. However, instead of nylon, the aramid fiber Kevlar came into use. In fiber form, it is about five times stronger than steel for the same mass, and used in multiple layers. While no exact modern rating exists for this, it is nominally Level IIA, unofficially tested to stop several pistol calibers, but not rifle fire. However, it was very effective at stopping fragmentation, and came with a matching Kevlar helmet that replaced the ancient steel pot. PASGT vest and helmet. Image: U.S. Army Natick Soldier Systems Center, Wikipedia. I wore this many days and nights on active duty, and didn't find it terribly uncomfortable, except while in Florida in May while wearing chemical warfare gear as well, or while in the Middle East. This armor is still in use with dozens of nations, a few Army Reservists, and Naval personnel who wear it while crewing weapons on deck. While no longer state of the art, it's still effective and worthwhile. It should be noted that early ballistic plates existed for certain special operations and police SWAT use from the 1960s. The plates tended to be small and rectangular over the heart—much like those early Bronze Age plaques. Moving into the 1990s, though, materials science improved again. We finally enter the era of modern body armor. Aramid fiber—Kevlar or Spectra, tough enough to stop virtually all pistol calibers—backed up with ceramic or steel plates capable of stopping most rifle bullets at least once, and if there isn't time to swap out during an engagement, usually survivable for about eight hits on the torso plate. The newer plates are rated for a single hit from armor piercing ammo, with good survivability for a second hit. Compared to the early armor with its mid 50 percentile protection, we actually now get close to 70 percent survivability, against much more powerful threats than our Bronze Age counterparts. Then, of course, we have far better medical technology. 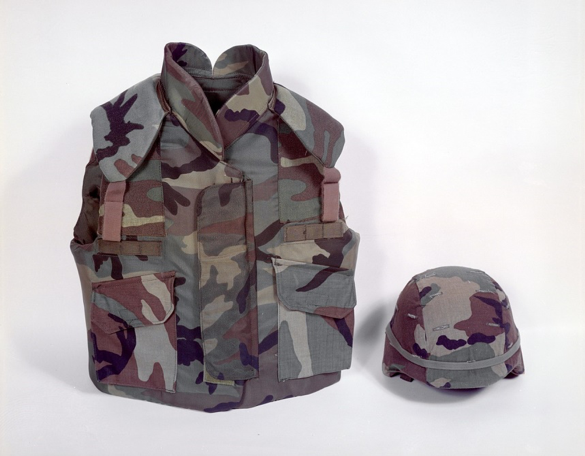 Interceptor Body Armor with additional coverage as worn by turret gunners in Iraq. This display does not include the ballistic plates. 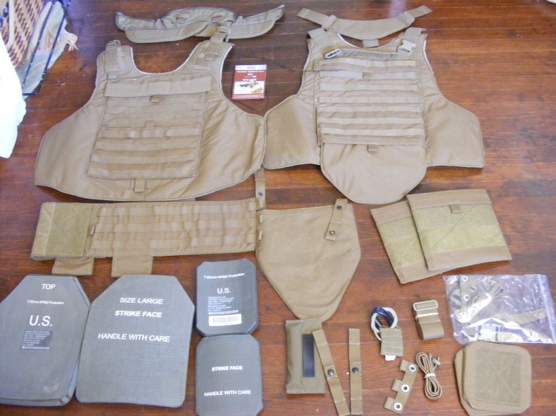 U.S. Marines Modular Tactical Vest as worn. Image: Sgt. Ethan E. Rocke, Wikipedia. MTV shown disassembled with plates and accessories. Image: Bahumut0013, Wikipedia. Armor will continue to get lighter. Trending now are polyethylene plates that pass the same specs as the ceramic plates, sort of, for about half the weight. On the plus side, they don't shatter when dropped. On the downside, they won't quite stop armor piercing 5.56mm, and degrade after a while in heat or ultraviolet. Still, it is a matter of a few years at most before 35 pounds of armor will cover head to ankle and stop all standard rifle rounds. In the constant game of offense vs. defense, this is going to cause a reconfiguration of weaponry, as much as heavy plate armor did against swords and spears. The logical notion of just using bigger, more powerful ammunition fails against the logistical issue of carrying it. We can't equip every troop with a .50 BMG rifle and enough ammo to fight even a short engagement. There are limits on how fast you can push a bullet in atmosphere. Blunt trauma behind the armor might eventually bruise someone to death, but with non-Newtonian materials that stiffen on impact, even that can be dispersed. So instead of harder, the response will have to be smarter. Options include a slightly larger bullet with a shaped charge penetrator that can punch through armor. If this happens, armor must again become heavier. Or, if it can't be made sufficiently strong, it goes away entirely for the time being, in favor of mobility. At the same time, larger rounds mean a lower number carried for the same mass and volume. This affects the logistics supply curve. Multiple "smart" rounds impacting the same location will degrade the armor until it can be breached. Currently, 2-3 rounds can do that to most plates. There are ways to put multiple projectiles into one cartridge, or fire bursts at much higher rates to accomplish this. Blunt trauma, if it can be delivered sufficiently, will still disable. "Leg" infantry might disappear entirely in favor of small dune-buggy style vehicles with 15-20mm launchers with hyperexplosive rounds. The troops would dismount as needed, but use the vehicle as a weapon carrier. Powered armor with mounted weapons becomes more promising, but carries with it its own need for maintenance, power, support, thus further increasing the tail to tooth ratio of an army, but with a concordant increase in lethality for the smaller tooth. Railguns are also a possibility, but the first challenge is making one small enough to be man portable and usable, along with its power supply. Then, we come back to atmospheric velocity limits for small projectiles. They might be insanely fast at close range, but within a hundred meters or so, down to the range of modern bullets. Larger projectiles can retain velocity better, but that reduces ammunition loadout again. Nothing comes free. Of course, you're all thinking, this would be a prime moment for energy weapons to appear, and indeed it would. We have no concept at present of how to make a laser efficient enough and powerful enough to be man portable, man lethal, and avoid massive amounts of waste heat. However, David Drake's Powerguns, as an example, use a cartridge that releases energy from a matrix when fired. Energy weapons themselves are not a magic counter to armor, however. All armor has some ablative effect. The response would be armor that ablates better, boiling off and degrading the impact, while soaking up the energy and releasing it in the resultant plasma. No matter how the evolution progresses, the armor will primarily be a cuirass over the torso, and protection for the brain. After all, medical science improves as well, but those remain the vital areas to protect. I'll let a physicist address that. Michael Z. Williamson is retired military, having served twenty-five years in the U.S. Army and the U.S. Air Force. He was deployed for Operation Iraqi Freedom and Operation Desert Fox. Williamson is a state-ranked competitive shooter in combat rifle and combat pistol. He has consulted on military matters, weapons and disaster preparedness for Discovery Channel and Outdoor Channel productions and is Editor-at-Large for Survivalblog, with 300,000 weekly readers. In addition, Williamson tests and reviews firearms and gear for manufacturers. Williamson’s books set in his Freehold Universe include Freehold, The Weapon, Rogue, Better to Beg Forgiveness . . ., Do Unto Others . . ., and When Diplomacy Fails . . .. He is also the author of time travel novel A Long Time Until Now, as well as The Hero—the latter written in collaboration with New York Times best-selling author John Ringo. He’s the editor of Forged in Blood, an anthology set in his Freehold science fiction universe, as well as upcoming anthology Freehold: Resistance. Most recently, Williamson has a novella in the John Ringo and Gary Poole edited Black Tide Rising anthology Voices of the Fall. Williamson was born in England, raised in Liverpool and Toronto, Canada, and now resides near Indianapolis with his wife and children.